Looking for its third consecutive Upper Iowa Conference title, the Turkey Valley boys’ basketball team needed to win its final two contests and hoped for South Winn to defeat North Fayette Valley, both of which happened over the weekend. 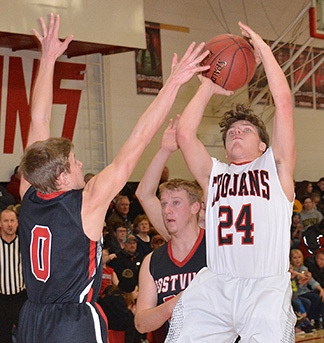 Friday night, the Trojans hosted Postville, defeating the Pirates, 60-34. TV took an 11-7 lead after the first quarter; however, the Pirates had a strong second quarter to get back in the game in the second frame. A Garrett Kurtenbach trey at the buzzer sent the teams to the locker room with a 27-18 score, in favor of the Trojans. The TV offensive poured it on in the third, scoring 20 points to lead 47-29 heading into the final frame. The home squad continued to run the floor well in the fourth to outscore the Pirates, 13-5, for the win. Knowing what was on the line, Coach Sullivan saw his team focused on the end prize from start to finish against Clayton Ridge on the road Saturday for the 45-29 win. “The kids were locked in the whole day beginning with shoot-around and knew what was at stake if we went over to Clayton Ridge and took care of business,” said Sullivan. Turkey Valley opens the postseason versus Nashua-Plainfield Thursday, Feb. 14, at 6:30 p.m. at Saint Ansgar in the Class 1A District 4 quarterfinals. A victory will send the Trojans to the semifinals at Rockford Tuesday, Feb. 19, at 8 p.m. versus Rockford, North Butler or Riceville.